Balayage hair is beautiful and it's been trending for awhile! This Balayage Painted Furniture Technique was inspired after hair! 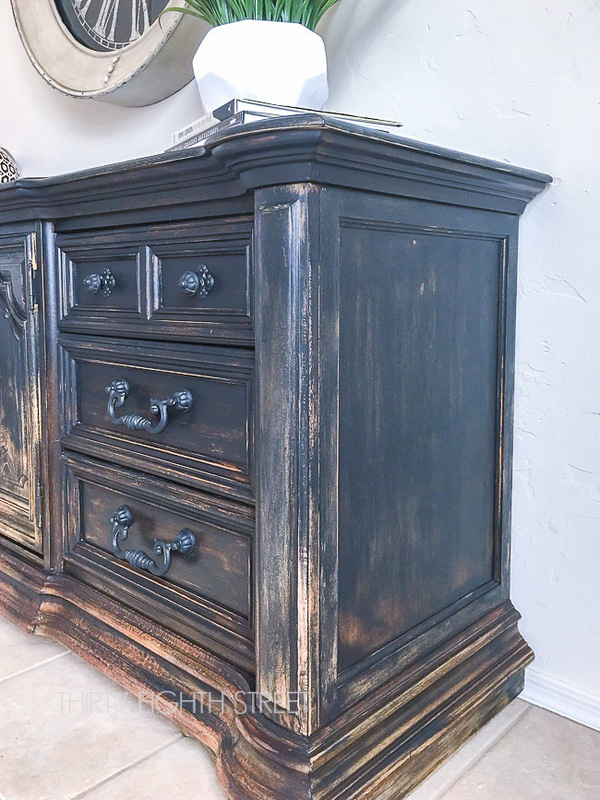 We went from full paint coverage and gradually distressed this converted media console for a unique rustic paint finish! Learn our painting technique with this easy DIY furniture tutorial! 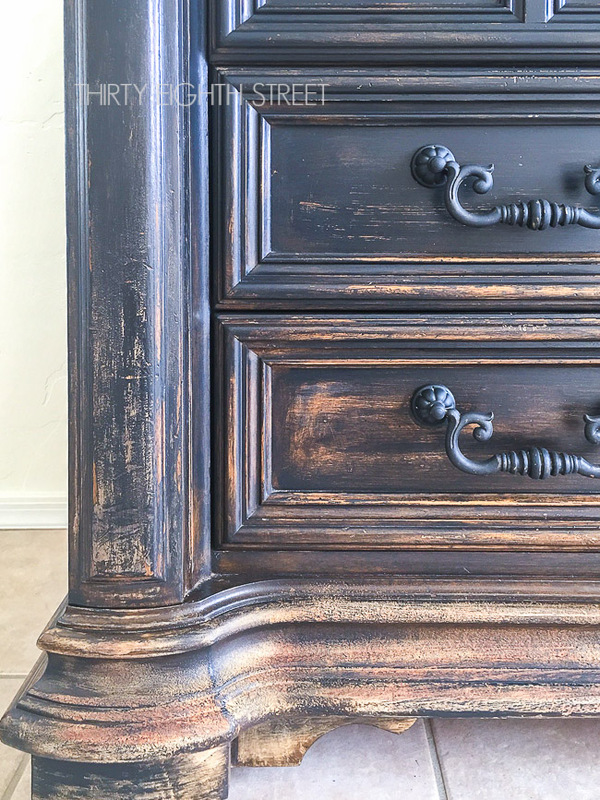 Disclaimer: I received paint from Country Chic Paint to complete this furniture makeover. What Is Balayage? | ba·lay·age balāˈyäZH/ noun. | Balayage is a technique for highlighting hair in which the dye is painted on in such a way as to create a graduated, natural-looking effect. Hmmm, I wonder if its hard to do? We're going to take the concept of balayage highlights and by its very definition try and apply it as a painting technique for furniture. 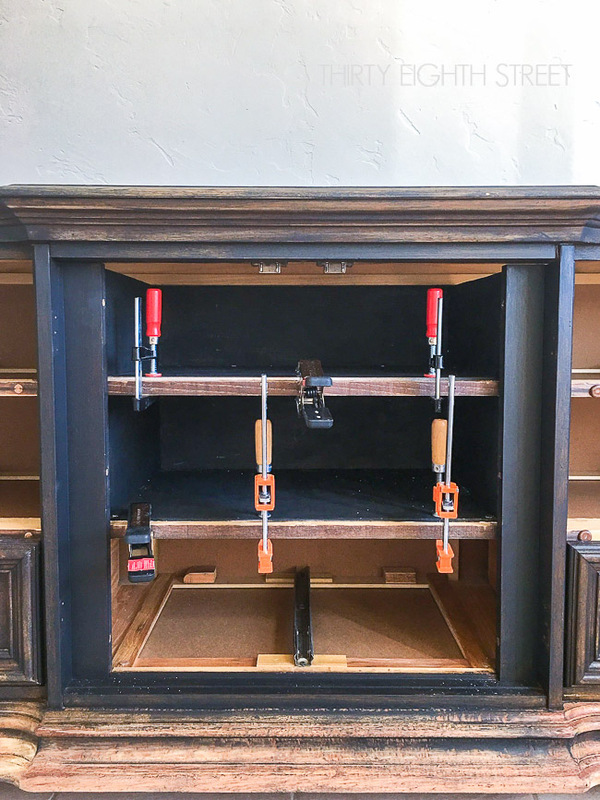 We're calling this project The Winchester Console. Look at this before picture. The poor little soul that sold us this piece had already sanded it part way before he gave up on it. Sanding furniture is not for the weary friends! We were beyond thrilled. Not only did we get this piece for a really low "get it outta of here" price tag but a good chunk of the hard work had already been done for us! In just a few short hours, we had the rest of the piece sanded and cleaned up. 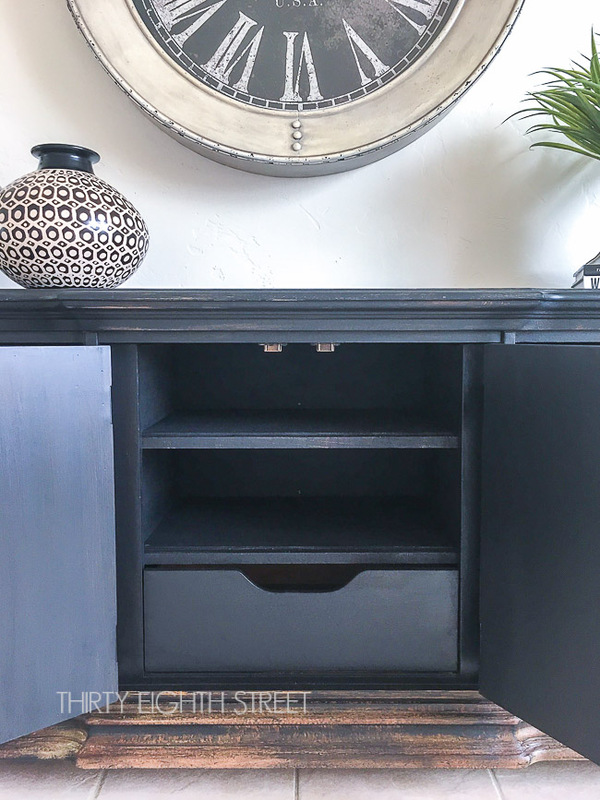 Before we could try out our balayage ombre painting technique we wanted to convert this stately Thomasville dresser into a media console. To create the shelves for T.V. components, we took out the top two drawers and removed the drawer rails. Then, we took measurements for the bottom inserts and sides and cut our wood. We used wood glue and finishing nails to secure them in place. 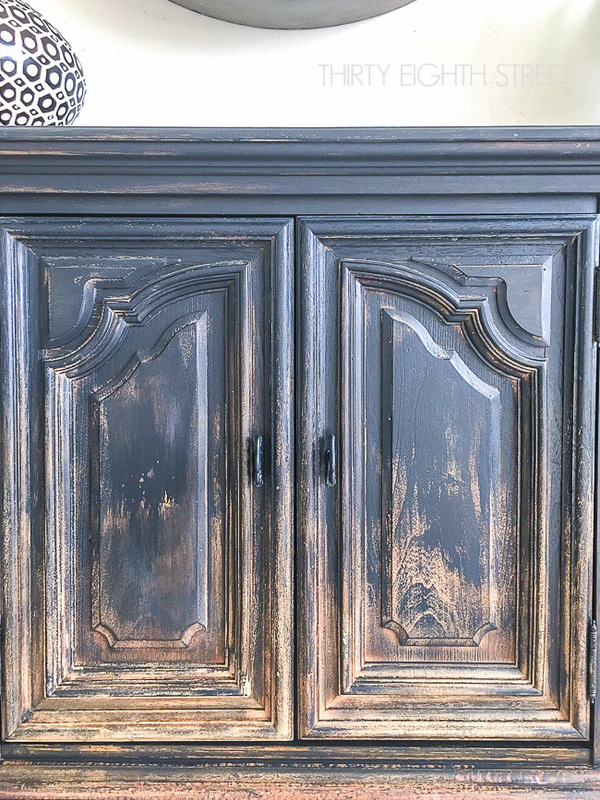 Once secure, we gave the inside one last coat of fresh paint using Country Chic Paint's in Liquorice. General Finishes in Lamp Black would also work! The idea behind a Balayage painting technique for furniture is that there's a gradual transition between colors or in this case (a lack there of). A Balayage finish is different then an Ombre finish. When you're using the Balayage technique you leave dark pieces of hair at the bottom. In the hair world, this creates dimension and a more natural sun-kissed look. We wanted to see if we could get that same sun-kissed look on furniture! Before you start, mentally divide your piece of furniture into thirds. The top third will have lots of color, the middle third will have less color and the bottom third should have almost no color. 1. I personally think it's easier to start with a sanded down piece of furniture. It doesn't have to be completely sanded. But, at the very least the bottom half of your piece should be sanded thoroughly with additional various areas throughout the rest of your piece. It's much easier to get the Balayage look by adding the paint color then taking it away via distressing and sanding. 2. Start at the top of your piece and paint for full coverage (mostly). Leave areas here and there where the original wood peaks through. This helps tie in that gradual look. 3. (Top third section) As you work your way down your piece. Take your freshly dipped paint brush and start your brush stroke at the top of your piece then sweep it in a downward motion so that the bulk of your paint color stays in the upper region of your piece. (Middle third section) Put less paint on both your paint brush and this section of your furniture piece. Take a rag and rub the paint into the wood (like you would a stain). 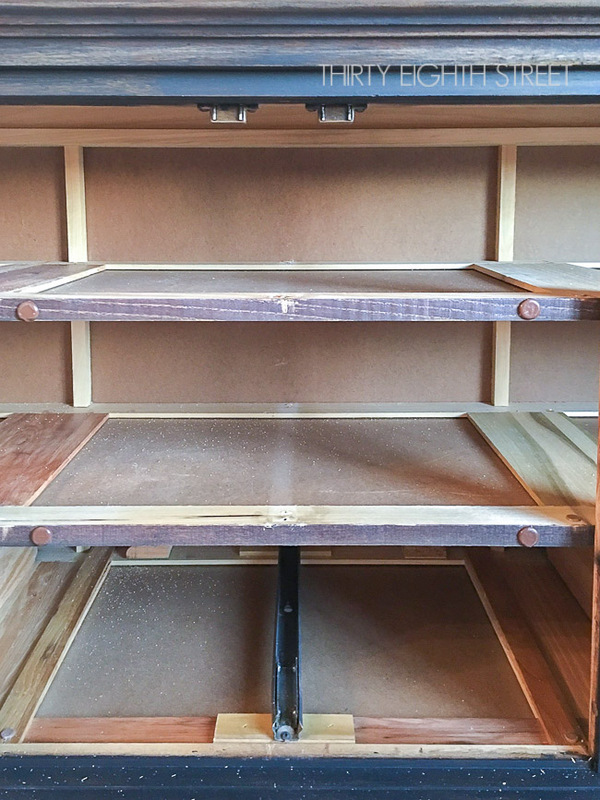 Be sure to overlap with your top section and leave areas near the bottom third section untouched to preserve the distressing. 4. 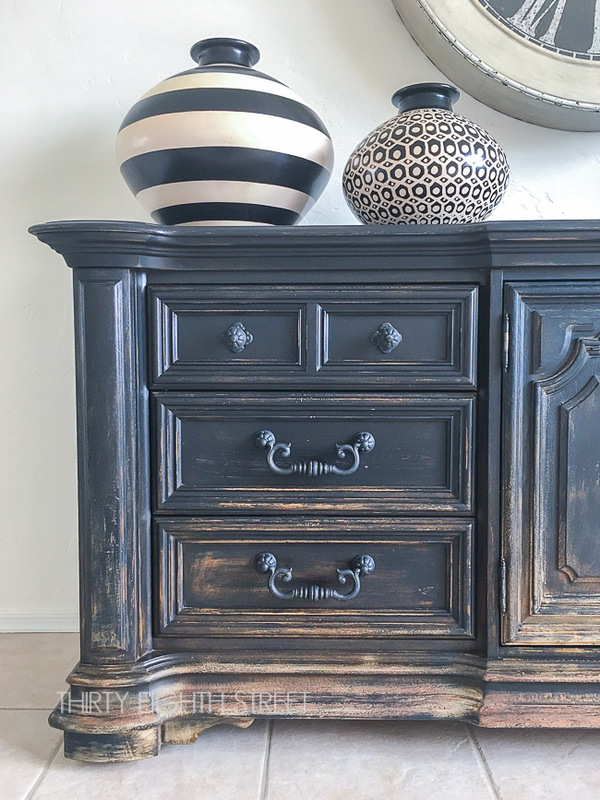 Then, take your paint brush and dry brush paint in various areas along the bottom of your piece to bring some dark color back into your furniture. 5. Lastly, take a damp rag and wet distress heavily along the bottom of your piece. Gradually get lighter with your distressing as you go up your piece. 22 Black & White Home Decor Pieces You'll LOVE! Dry Brush Painting Technique That Makes Furniture Look Like Art! Grab a drink, put your feet up and watch us work away on this Balayage painted furniture piece! 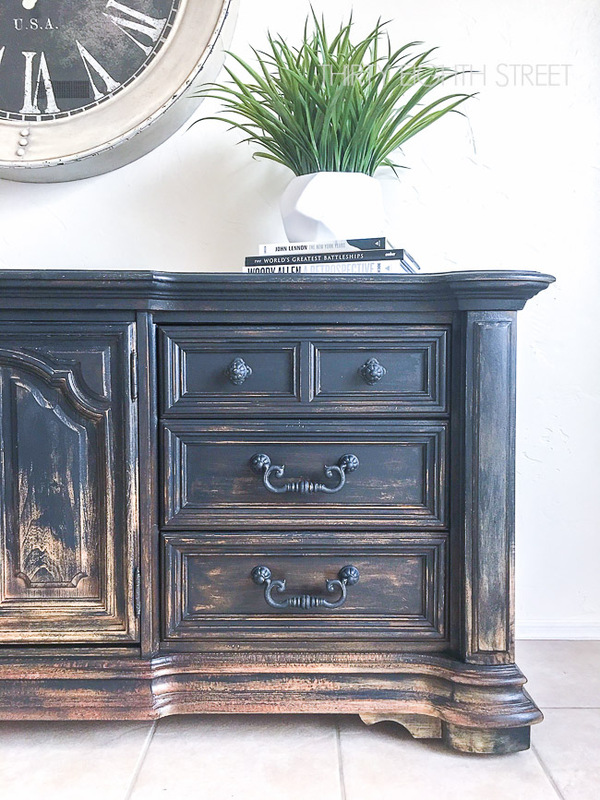 If you have time for one more furniture makeover, this Restoration Hardware Inspired Dresser Makeover might catch your eye! We hope you've been inspired to try something new this week! 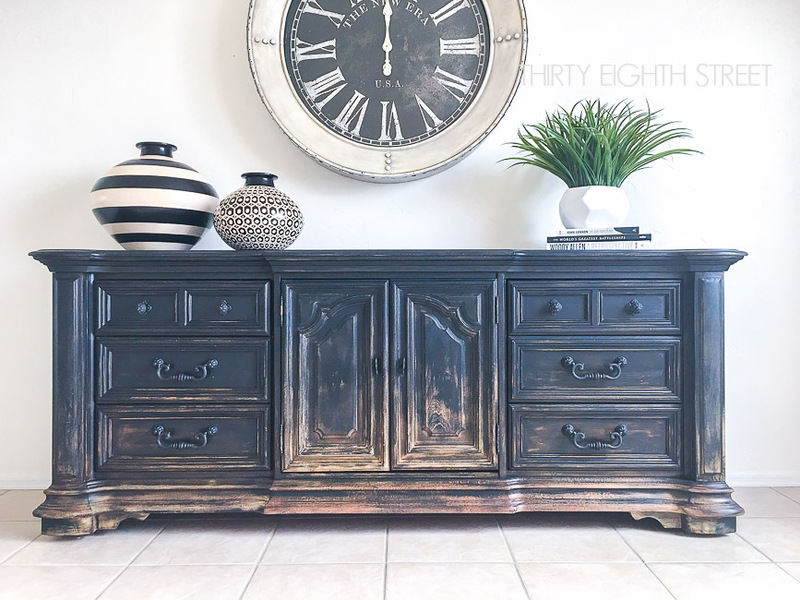 If you enjoyed this tutorial and furniture makeover, we would love it if you'd share it on Pinterest or Facebook! Googly eyes... holy moly this is my favorite piece ever! Nicely done friend! Really!? Wow! Thank you, Lynn! I just found my 'favorite'! I love all the different finishing techniques however, this one blew me away! Gotta go find something to refinish! Thanks so much. Thank you, Linda! This was really fun to create! So glad you liked it! I debated back and forth whether or not to go for it... but I'm glad I did! Ive never heard of this technique for hair or furniture lol... its really gorgeous!!! A great piece of furniture to start with and you surely brought it new life. That is one cool piece of furniture. I recently did this technique on both of my daughters hair. It looks fantastic on hair and on your media console. Wow!! I bet it looks great on your daughters hair! This piece almost looks like its on fire. ;) So glad you liked it, Mary! This looks so good! Definitely a huge change. What a gorgeous piece of furniture, great job! Oh, this is super fun! I haven't every heard of this technique, but I really like how it turned out! I've never seen it on furniture before either. The thought popped into my head and I went for it! This technique is so cool! 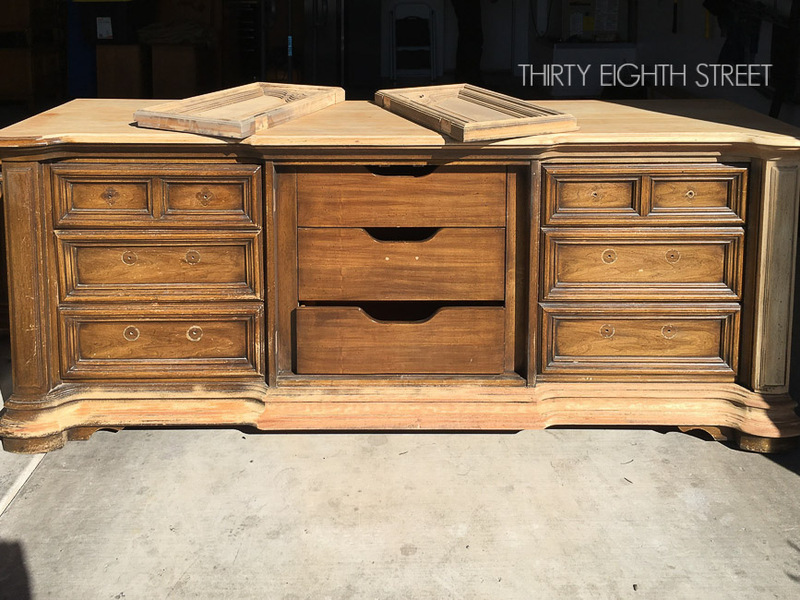 What a beautiful transformation, and how lucky you found a piece that was partially prepped. I counted my lucky stars! I have some things I want to refinish, so this really helps me. I love how it came out. I really like this color too. I think I'll start slow and then move onto bigger things like the kitchen cabinets! Eeek! Phenomenal transformation, I love the way this console turned out! Thank you for your sweet words, Lori... you made my day! Have a great week! Such a great look...thank you for sharing...love this!! You're welcome, Michelle! Glad you liked it! I love this look! Gorgeous piece! Looks like you did a lot of work to save this piece. Thanks for the info -- I had never heard of balayage. Pinning. Thank you, Carol! I'm grateful that I acquired the piece with a good part of it already sanded! Simply gorgeous! it's amazing what some TLC and paint can do. Love you, Colleen! Looks like it's kind of on fire, right? ;) Blending- I think the trick to this look is to sand first. Controlling the paint is much easier then trying to control your sanding. Oh my gosh that looks absolutely amazing. Definitely a piece I would love to have in my house! It is gorgeous! Thank you, Jennifer! It sure was a fun one to work on! Glad you liked it, Jessica! Thanks for stopping by! Wow! I love balayage as a hair style already, and now on this media console it looks so fabulous, so cool! Thanks so much for sharing at Sweet Inspiration, have a lovely weekend! I love it on hair too, Katrin! Thank you for sharing our work! Impressive! Really turned out beautifully. Thanks for sharing with us at Snickerdoodle this week. Pinning. I love the way your brain works! Hair art turned into furniture art, and it looks fantastic. BTW, that is a killer piece, that guy didn't know what he was giving up, it's a stunner in balayage. I'm pinning this so I can find a piece to work this magic on, I love it. What a great tutorial! Your dresser looks amazing! Glad you enjoyed it! Thanks, Kim! Off all your makeovers this is my favorite. I love that you gave such a detailed tutorial. Thank you for sharing at Vintage Charm! I am featuring your Balayage Inspired Painted Media Console at Vintage Charm tomorrow. I'll be sure to stop by tomorrow! Thanks so much, Sharon! I have no words Carrie, this is probably THE most beautiful piece of furniture I have ever seen. So incredibly stunning. Just WOW!!!! Thank you, Michelle! I had such a great time creating this one! I am in complete love with this! Thanks for sharing it with us at Family Joy Blog Link Up Party this week. So glad you joined us. I'm so glad you liked it, Charlene! It was such a fun piece to create! This media console looks so beautiful!! I love the balayage treatment you gave it. I would like to try this technique someday. It looks so awesome!! I loved it so much. I had one very similar did it in an azure color for a client. I love it soooooo much. I really love your technique and I didn't even notice the Beautiful bottom accent on the dresser until the new finish was applied what a nice way to show off certain attributes of furniture.